I've found that there are two ways of listening to these works. The first is to listen to them as slowly modulating drone harmonies with ornamentation providing a "rough surface" (or perhaps "imperfections in the paper", from a Cage-ian perspective). This gives these works a kind of meditative, ritualistic feel, and the metal percussion signals reinforce this imagery. The other way (and I think this may be the more intended way) is to concentrate on the ornamentation as a foreground layer on top of a static harmonic background. In this interpretation, the various articulations "speak" to each other, using the 5 languages applied to the 5 layers. 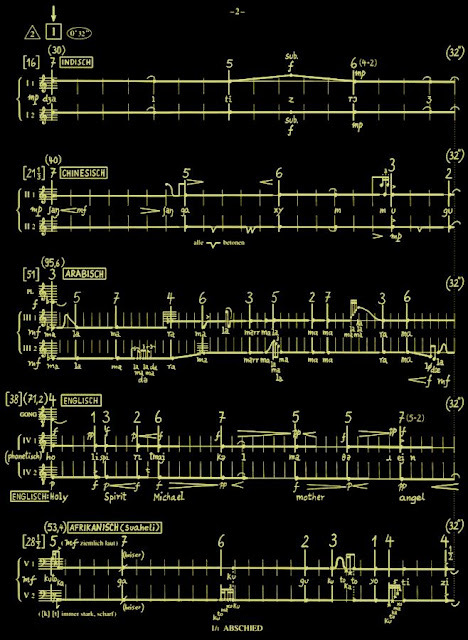 Stockhausen also emphasizes that the figures and glissandi are "more important than the sustained tones...and should be played very clearly, slightly louder, and never casually or as ornaments." In any case, it's fascinating to compare and contrast these 4 arrangements of essentially the same melodic and harmonic material. Because of these versions, HOCH-ZEITEN becomes a true exploration of timbre and coloration, expressed vocally, instrumentally, electronically and electr-acoustically. The Memories and Blend-ins of the choral and orchestral versions add an additional dimension as well. Naturally, these Memories become much more meaningful after one has become very familiar with all of the Scenes of the LICHT opera cycle, but even without the recognition factor, they provide a nice contrast to the tightly-focused structure of the main body. However, just as in DONNERSTAG AUS LICHT's last Scene, VISION (which features a brief revue of that opera's previous scenes), these reminiscences of operas past give the listener who has travelled through all 7 "Days" the strong feeling of an epic journey completed.